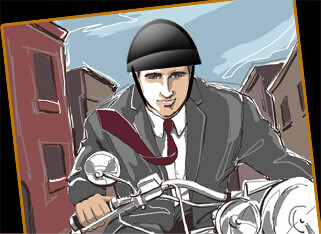 Spring Is Coming, But Before You Ride, Remember These Tips! Spring is finally here this week! At least that’s what the calendar says. I’ll be getting my bike out soon and going for my first ride of the season, but first, we’ve all seen what’s left of our roads after our long, brutal winter. If you’re like me, we’re all used to the dangers of spring riding. So here is a list of things to think about as we get the bikes back out. Loose stones at intersections – Those little stones roll right out from under the foot when you put it down at a stop. Every intersection is a minefield of stones. Keep your eyes peeled for a good place to come to a stop and a safe place to put your foot down as you approach intersections. Loose stones are everywhere else! All winter, those salt trucks have been dropping stones along with the salt. It will still be a while before the natural action of cars and trucks sweeps the stones to the side. It will also be a while before the street sweepers are out to pick them up.In the meantime, those stones are piled up in places we least want to see them – the corners and the right side of the lane. For the time being, it’s not a bad idea to stay to the left side of the lane and go easy in the corners. There is no guarantee traction will be there when you need it. Salt water is slippery! There is still some salt on the roads. If you are out riding in the rain or other times, there is moisture on the roads, so look out. Salt water is slippery – and you won’t have the traction you might expect to have. After a couple hard rains, the salt should be gone for the season. 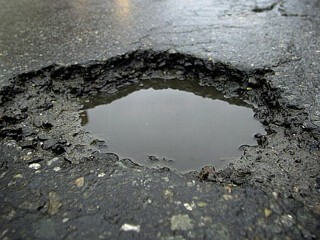 Potholes, potholes everywhere – Salt, freezing temperatures and snow plows do a number on the roads. What might have been a small crack in the pavement last fall could be a pothole big enough to swallow your bike. We have a tendency to relax and maybe not pay full attention to the road surface when we are on our favorite roads. Don’t assume that favorite route will be in the same condition it was in back in October! You may find a giant pothole in your path as you lean in to that turn. Cagers! They are still out there, and they are still trying to kill us. 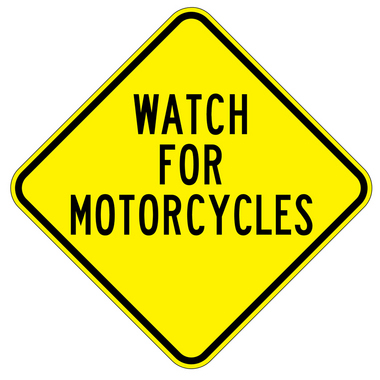 They are more dangerous than ever at this time of year because they haven’t seen a bike in months and have pretty much forgotten about us. They are still talking on their cell phones, eating while driving, and doing everything BUT paying attention to where they are going. Give them even more room than normal at this time of year, and make sure they see you before you put yourself in harm’s way. I know there are plenty more seasonal dangers I haven’t listed, so leave a comment and tell me what they are. In the meantime, I’m getting back on the bike! This entry was posted in Motorcycle Accidents, Motorcycle crashes, Motorcycle Safety, motorcycles intersections, Uncategorized and tagged accident attorney, accident lawyer, Adam Gee, Adam M. Gee, American Motorcyclist Association, attorney, Elmira New York, Harley-Davidson, Helmet, injury, Interstate 86 motorcycle crash, Motorcycle, motorcycle accident, motorcycle safety, new york motorcycle, New York motorcycle attorney, new york motorcycle attorney adam gee, new york motorcycle crash, NY accident attorney, NY and PA motorcycle lawyer, NY biker lawyer, PA motorcycle accident attorney, PA motorcycle accident lawyer, Pennsylvania motorcycle accident attorney, Pothole, Road, Roads and Highways, Traffic collision, Twin Tiers, United States. Bookmark the permalink.